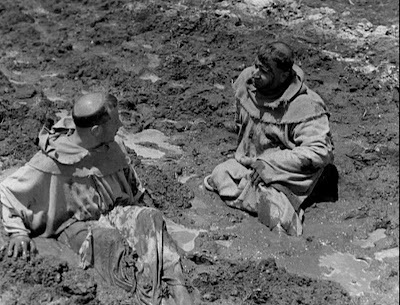 Roberto Rossellini’s The Flowers of Saint Francis (Francesco Guillare di Dio, translation: “Francesco, God’s Fool”, 1950) bewildered critics when it cam e out, since it appeared to be a strange amalgam of spirituality and realism. As a consequence the film was a critical and commercial failure, even though Rossellini later remarked that it remained his personal favourite. Rossellini had become an international star director when he effectively launched the Italian Neorealist movement with his postwar trilogy, Rome, Open City (Roma Città Aperta, 1945), Paisan (Paisà, 1946), and Germany Year Zero (Germania Anno Zero, 1948). But thereafter he was charged with having strayed from the Neorealist aesthetic, and The Flowers of Saint Francis was dismissed as an intellectually and aesthetically confused offering. Was slapstick the appropriate genre for such an enlightened spirit as Saint Francis? 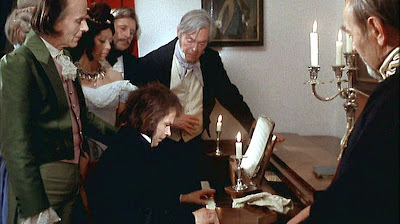 Of course, there were others, including eminent film directors, who embraced the film as a work of genius. 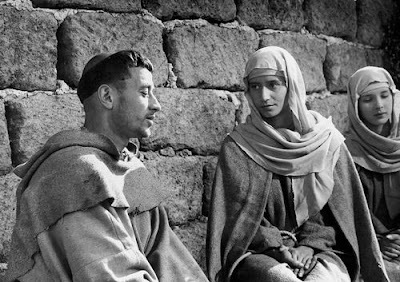 For them, Rossellini’s film was not an exalted evocation of the other world, but instead uniquely grounded Saint Francis’s humanity in everyday human existence. As usual with Rossellini, the acting was performed by nonprofessionals drawn from the social milieu of the story. In this case monks from the Nocere Inferiore Monastery played the roles of Francis and his friars. The script, co-written by Rossellini and Federico Fellini, was episodic in structure, which for Rossellini was a return to the narrative format of his greatest successes, Rome, Open City and Paisà. It covers nine episodes that have been drawn from the 14th century works, Little Flowers of St. Francis (I Fioretti Di San Francesco) and T he Life of Brother Juniper (La Vita di Frate Ginepro) that compiled tales about Saint Francis and his followers that had been passed around in the years following his death. Although the nine episodes, or “chapters”, are all supposed to take place in the two years following the endorsement of his order in 1210 by Pope Innocent III, there are some anachronisms here. Since Francis had only taken up his spiritual vocation in 1209, the film begins at an early stage of the Franciscan movement, when Francis had only eleven followers. Francis and his followers return in the rain to a humble hut they had just constructed, only to learn that the small shelter is now claimed by a peasant and his donkey. Rather than contest this usurpation, Francis urges his followers to relent and to rejoice that they have finally done something useful in God’s world. The friars then go on to construct a small chapel, Saint Mary of the Angels. 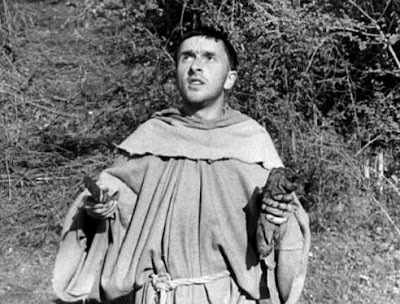 Also in this episode, one of the friars, Brother Juniper, returns to the chapel half-naked, because he had given away his tunic to a beggar. Francis gently admonishes him for his naive generosity and instructs him to remain behind at their chapel thereafter to prepare meals for the other friars to eat when they return from preaching. A simpleminded old peasant, Giovanni, comes to Francis and joins the brotherhood. A nun from a nearby monastery and an ardent follower of Francis’s mission, Clare (Chiara Offreduccio, who would later found a monastic order for women and is now known as Saint Clare of Assisi), comes to visit Francis and joins the friars in a dinner. 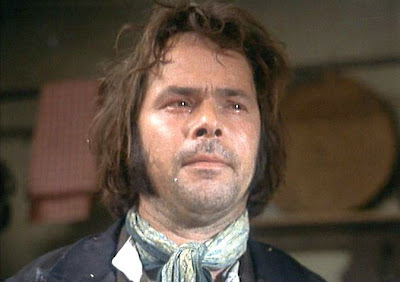 Seeking to provide an ailing brother with his favourite pig’s foot stew, Brother Juniper goes out in the woods and thoughtlessly cuts off the foot of a wandering pig th at he finds. While praying one evening in the woods, Francis encounters a leper and is overcome with compassion. 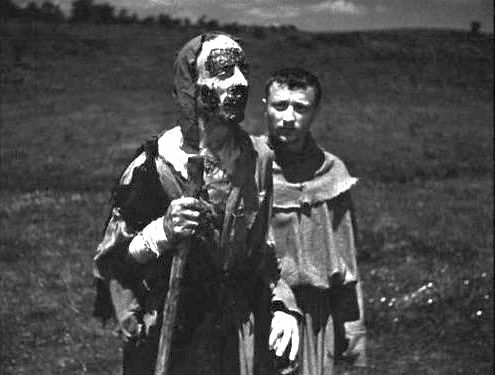 Despite the leper’s efforts to keep his distance, Francis embraces him. Brother Juniper, seeking to free up time from his cooking duties so that he can join in the preaching, cooks the entire two-weeks worth of food that the group has in store. Again the tolerant Francis only smiles and grants Juniper the desired permission to preach. Now preaching in the world, Brother Juniper runs across a rowdy warlord gang, whose leader suspects him of being an assassin and orders him to be executed. 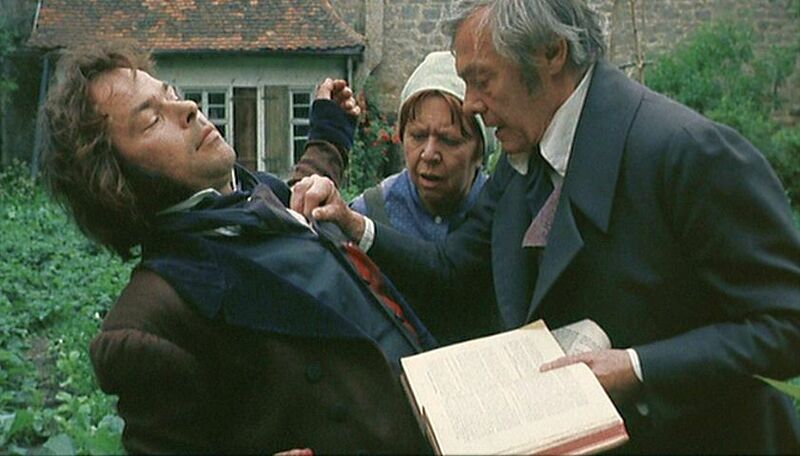 But Juniper’s meekness and humility dumbfounds his captor and moves the “tyrant” to release him and abandon military siege he had been conducting. Francis and Brother Leon discuss what is perfect happiness, with Francis dismissing a number of suggested scenarios as not achieving the desired perfection. Then they seek alms in the name of Jesus at a residence and are rewarded with a sound beating by the owner, at which point Francis proclaims that this kind of suffering for God is exactly what constitutes perfect happiness. 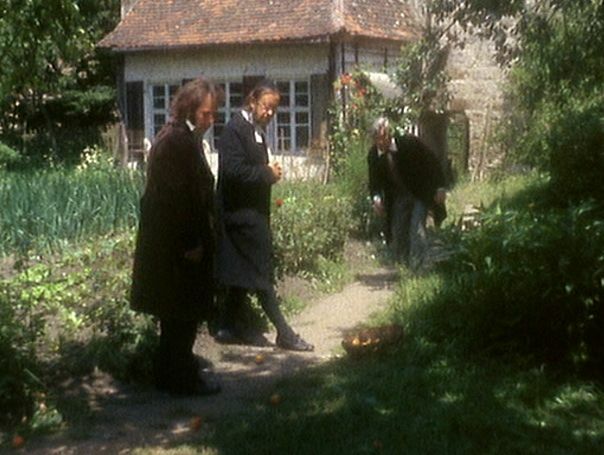 Before sending the brothers separately out into the world to teach, Francis has them spin around until they are dizzy and fall to the ground. The individual directions they now face will be where God wants them to head out to preach. There is little narrative progression in The Flowers of Saint Francis, and the nine episodes can collectively be considered to paint a psychological portrait of Francis and his nascent group. Each of the episodes seem to highlight the almost absurd gaiety of the Fra nciscans in the context of their miserable poverty. They are all presented as holy fools wallowing joyously in the mud. This sharply contrasts with typical films about religious figures, who are typically presented as (eventually) exalted souls that soar far above us ordinary sorts. Here in this film, Francis and the brothers are so ordinary, and their circumstances are so confined and squalid, that we find it hard to believe that this represents the origins of a holy order. And yet Rossellini’s neorealist aesthetics makes these figures come alive as real, believable people. I have remarked on Rossellini’s neorealist aesthetics before, in “Aesthetics of Two Neorealist Films: Open City and Paisan”. There is an emphasis on direct, sometimes melodramatic action and, at the same time, the maintenance of a somewhat detached perspective on the part of the camera (the narrative’s “silent witness”) that generates a sense of newsreel immediacy. This is enhanced by the naturalness of his nonprofessional actors that evokes a realistic social milieu. It is an evocation of realism in our subjective consciousness, rather than a true representation of what actually happened. As an example, criticism of the film illustrates the distinctions concerning what is true “realism”: some critics complained that the friars in Rossellini’s film looked too comfortable and well-fed for what must have been emaciated 13th century religious mendicants living in extreme poverty. They complained that Rosellini’s friars were not realistic, despite the fact that Rossellini had engaged real Franciscan monks to play the roles. Rossellini, the humanist, was seeking realism in a different dimension than the purely physical and external. 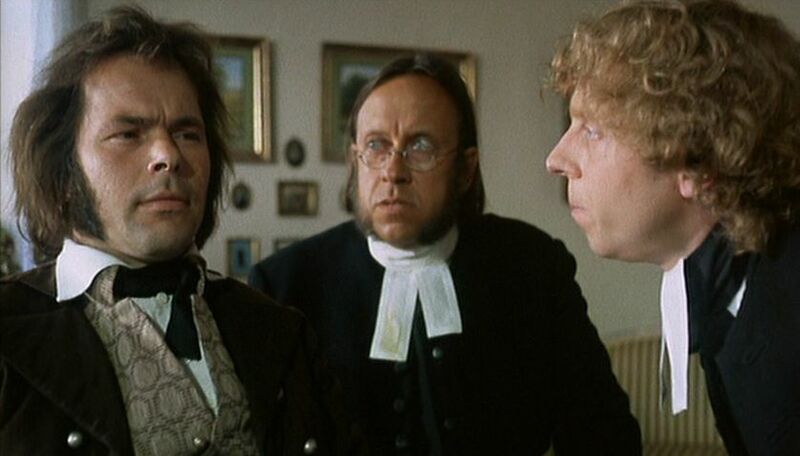 Moreover, true realism of any sort seems to have been entirely abandoned in episode 7, which features the one professional actor in the film, Aldo Fabrizi, whose music-hall hamming as the “tyrant” Nicolaio, features bug-eyed histrionics that belong more in slapstick comedy. These comedic effects not only reduce our feelings about the authenticity of the scene, they also threaten to make the band of brothers appear ludicrous and undermine our overall appreciation of Saint Francis, himself. 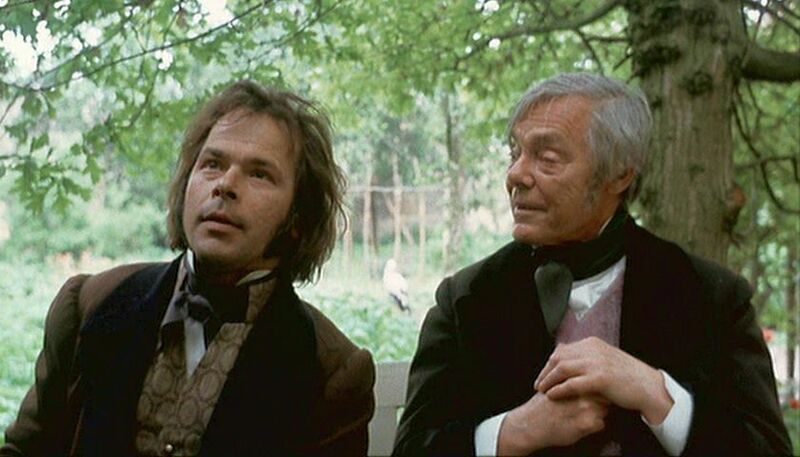 In particular, those parts of the film featuring Juniper (Ginepro) and Giovanni (episodes 2, 4, 6, & 7) focus on two disciples who seem not to have fully embraced a life of “Sufic” compassion towards others. Giovanni is innocent, but seems to be more of an imitator of outward behaviour, than someone who had fully digested the message of compassion. Juniper is both innocent and selfless, but his literal-minded adherence to Francis’s rules lacks real comprehension and is ultimately destructive. His hacking off of the pig’s foot (which some people apparently regard as funny) is a repugnant example of how mindless rule-following, without any deeper understanding, can be ruinous to one’s fellow beings. All we can say is that his actions remind us that there is no inherent virtue in innocence. Nevertheless, the spiritual limitations of Juniper and Giovanni do not necessarily detract from our appreciation of Francis, but only remind us of the typical kinds of people who are often attracted to the spiritual path and which one is likely to encounter along the way. And this returns us to the key quality of this film – the ordinariness of the characters, their simple humanity that underlies many of Rossellini’s films. 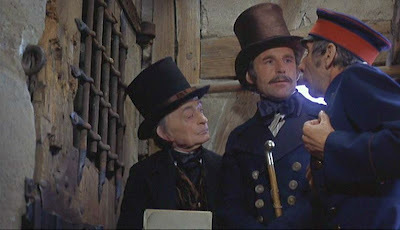 There are a number of moments and images from this film that linger in the mind afterwards. Francis’s vivid and emphatic references to “Brother Fire” and “Sister Death”, which suggest his inner connection with all of reality, all experience. The picture of Brother Juniper’s sense of satisfaction as he holds up the pig’s foot that he has just amputated. 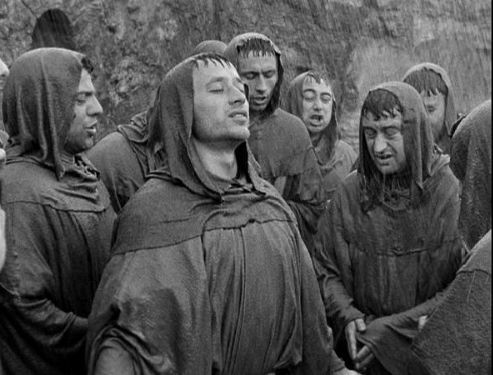 The images of Francis and his brothers almost celebrating their physical wretchedness in the rain and mud, suggesting that their self-realization of their inner sturdiness brings them greater joy. Francis’s late-night encounter with the leper. 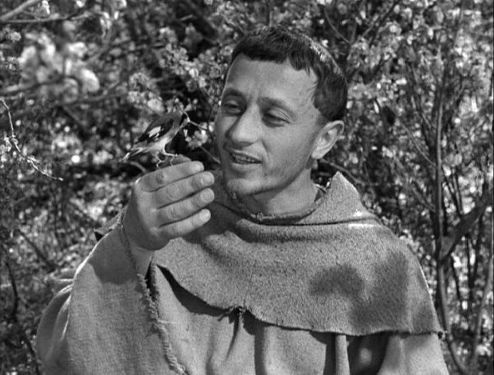 Francis talks to a little bird that comes to his hand. The tentativeness associated with the meeting with Saint Clare. It is an odd potpourri from Rossellini, but it is unique and definitely worthwhile seeing.